Knead sugar, almonds, samid and clarified butter, equal parts, and make them like breasts, and arrange them on a brass tray. Put it in the bread oven until done, and take it out. It comes out excellently. Features in Medieival Arab Cookery, ed. Maxime Rodinson. If I had to nominate a signature dish, this would probably be it. I have cooked this dish multiple times, and handed out the recipe many times as well (you can find the original recipe, along with the story of its development, here). It’s an easy recipe, the biscuits are delicious, and there is room for as much innuendo as you please. However, the texture was slightly grainy. I put this down to the sugar, because it’s difficult to cream clarified butter and sugar together, and the sugar doesn’t completely dissolve. 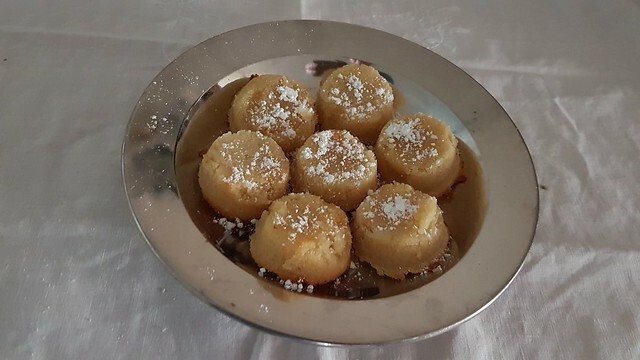 I have recently been revisiting Middle Eastern cooking with one of my apprentices, and I noticed there are recipes in various sources calling for powdered sugar (which in Australia is known as icing sugar). Knowing powdered sugar dissolves very quickly in any liquid (such as clarified butter), I wondered whether replacing the caster sugar with icing sugar would give a better result. It does. The resulting biscuits have a much smoother texture, and are easier to shape as the mix is moister. Mix the semolina and almond meal in a bowl. If your clarified butter is not melted, melt it, and then combine with the sugar until the sugar is dissolved and the mixture is frothy. You can do this step with an electric mixer. Gradually add the combined semolina and almond meal to the butter and sugar – it is better to do this by hand. Bake for around 12-15 minutes, until pale gold. Clarified butter, or ghee, is butter with the milk solids removed. To make it, heat butter over a gentle heat until it is completely melted and bubbling. You will see a white scum on the surface. These are the milk solids. Strain the melted butter through a strainer lined with a double layer of muslin and you will be left with lovely clear clarified butter. Because the solids are the bit that makes butter go rancid, clarified butter does not need to be stored in the fridge. Some lactose intolerant people are fine with clarified butter, as most of the lactose is removed with the solids. You will need about 250g of butter to get 200g of clarified butter, or you can buy ghee from Indian or Middle Eastern grocers. There is some debate about what samid is; it’s definitely some sort of wheat product, but it’s not normal wheat flour. Charles Perry believes it’s fine semolina (Perry, 2005, 22), which is made from durum wheat, also used to make pasta. It’s coarser than ordinary wheat flour. However, Nawal Nasrallah believes it’s finer than ordinary flour, in which case it would be similar to wheaten cornflour(Nasrallah, 2009, 573). Based on my own experimentation, I get better results from semolina, as wheaten cornflour loses too much structure in cooking, and you wind up with mush rather than dough. However , make sure you get fine semolina rather than coarse, as coarse semolina feels like sand in the mouth. The original recipe specifies a “bread oven” temperature, which normally would mean a very hot oven. However, I have found that cooking the breasts at a temperature above 180°C leads to them burning quickly, while the middle is uncooked. And no one likes burned breasts. Click on the links below to order books directly from the Book Depository. Jurjaniyya: The way to make it is to cut up meat medium and leave it in the pot, and put water to cover on it with a little salt. Cut onions into dainty pieces, and when the pot boils, put the onions on it, and dry coriander, pepper, ginger and cinnamon, all pounded fine. If you want, add peeled carrots from which the woody interior has been removed, chopped medium. Then stir it until the ingredients are done. When it is done, take seeds of pomegranates and black raisins in equal proportion and pound them fine, macerate well in water and strain through a fine sieve. Then throw them into a pot. Let there be a little bit of vinegar with it. Beat peeled sweet almonds to liquid consistency with water, then throw them into the pot. When it boils and is nearly done, sweeten it with a little sugar, enough to make it pleasant. Throw a handful of jujubes on top of the pot and sprinkle a little rosewater on it. Then cover it until it grows quiet on a fire, and take it up. Kitab al Tabikh Chapter I (The Book of Dishes, trans. Charles Perry and published as A Baghdad Cookery Book). For explanations of the ingredients, see the Notes below. If you are using dried jujubes, put them in a bowl with just enough water to cover them, and leave aside to rehydrate. Cut the lamb into roughly equal sized pieces, removing any sinew (the silvery membrane you find on the edges of the meat). Put the lamb into a pot with just enough water to cover it, and the salt. Bring to the boil. Meanwhile, peel the onions and dice finely. Peel the carrots and slice into julienne strips, leaving out the core of the carrot. Finely grind the spices in a mortar or electric grinder. When the pot with the lamb is boiling, add the onion, carrot and spices. Stir well and reduce to a simmer. Meanwhile, put the pomegranate seeds and raisins in a mortar with enough water to cover them, and pound well. This can also be done with a blender. When the mixture has reached a smooth consistency, strain it through a fine cloth to remove any pieces of pomegranate seed. 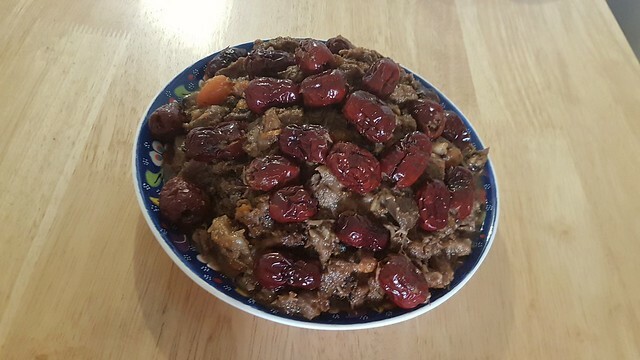 When the meat has started to soften and the liquid has reduced a little, add the raisin and pomegranate mix, vinegar and almond milk to the pot and continue to simmer. Drain the jujubes if necessary, and pour on top of the meat. Serve warm. The name of this dish derives from Gorgan, a city on the Caspian Sea (Perry, 2005, 31). Jujubes (Ziziphus jujuba) are also known as red dates or Chinese dates (the Chinese names are da zao or hong zao – many thanks to Facebook user Andi Houston for the Chinese names), and you may be able to find them dried in Asian grocers. The can also be found in Middle Eastern grocers. 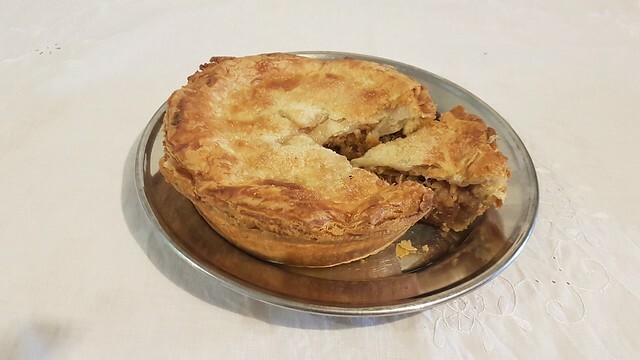 They have quite a tart taste, which in this case complements the rich flavour of the lamb and the slight sweetness of the cooking liquid. If you can’t find true jujubes/red dates (and they aren’t the easiest thing to find) do not substitute regular dates, as they are too sweet. I would suggest sliced, red-skinned plums to imitate the taste and colour. Stewed dishes such as this often specify “fat meat,” which becomes extremely tasty and succulent when cooked for a long time and slowly, such as in this dish. Look for cuts such as forequarter or neck to get the best results. Perry, Charles (2005). A Baghdad Cookery Book. Hais: Take excellent dried bread or biscuit (ka’k) and pound it well. 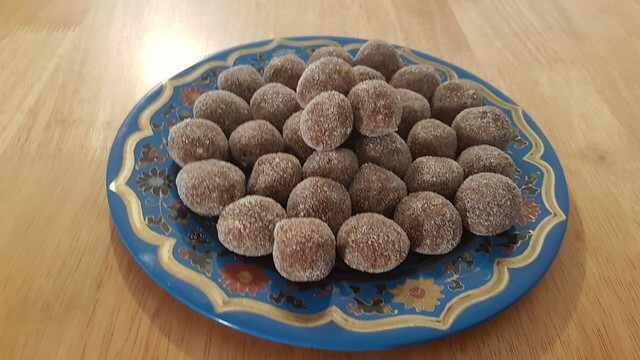 Let there be a pound (ratl) or it and three quarters of a pound (ratl) of fresh or preserved dates – let their seeds have been removed – and three ounces (uqiya) of pounded almond and pistachio meats. Macerate everything well and strongly by hand. Then refine two ounces (uqiya) of sesame oil (by frying spices in them) and pour it on it. Knead it continuously until it is mixed. Make it into balls and dust them in finely pounded sugar. If you want, replace the sesame oil with clarified butter. This is good for travelers. Kitab al Tabikh Chapter X (The Book of Dishes, trans. Charles Perry and published as A Baghdad Cookery Book). In Middle Eastern cultures, sweet dishes are not served at the end of the meal – instead fresh fruit is eaten. Dishes such as these tend to be reserved for celebrations or social occasions, and are an important part of guest hospitality. However sweet dishes are not exclusively served only at special times – they can be eaten whenever desired (Salloum et all, 2013, 1). 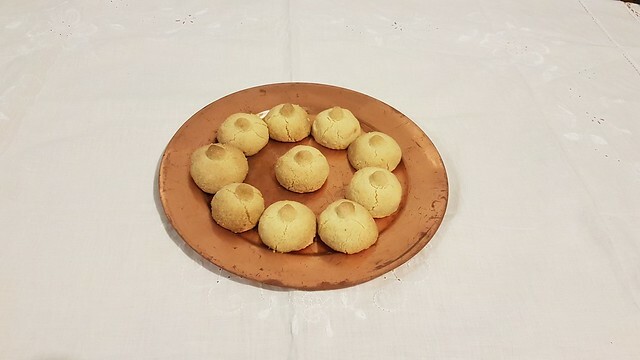 Hais developed from a Bedouin dish (Salloum et all, 2013, 211), as suggested by the direction that it is good for travelers. No doubt the Bedouin version was much simpler than the Baghdad version. Put the pistachios in a bowl of boiling water for about 10 minutes, then rub off the skins. Allow to dry. In a mortar and pestle or food processor, roughly grind the nuts. They don’t have to be finely or consistently ground. Add the dates and bread crumbs to the mortar and pestle or food processor, and process until the mix has come together. If using the mortar and pestle, use the pestle until the dates are mashed, then use your hands. Put the sesame oil and spices in a frypan, and fry over a medium heat until you can smell the spices. Pour the spiced oil over the date, bread crumb and nut mix, and continue to process until the mixture binds well. Roll the mix into balls, then roll these balls into the caster sugar until they are well coated. The Hais will keep very well in an airtight container in a cool place. However they are unlikely to remain uneaten for long. It is far better to make your own breadcrumbs rather than use bought ones – the texture of freshly made crumbs is superior. You can either use a fine grater or a food processor to produce breadcrumbs. If you are used to Asian cooking you’ll assume sesame oil should only be used sparingly, as the type of sesame oil used in Asian cooking can be overpowering if used heavily. However, this type of sesame oil is produced from toasted sesame seeds, which heavily concentrates the sesame flavour and aroma. If you are familiar with modern Indian or Middle Eastern cooking, you might have come across virgin or cold-pressed sesame oil, which is much paler and more subtly flavoured. This is the sort you need to use for baking.If are going to be cooking for anyone with a sesame allergy, almond oil, rice bran oil or canola oil make good substitutes (the last two don’t have any flavour). Refining oil means to gently fry spices in it. As with medieval European recipes, specific spices are often not specified. The spices I have chosen are popular additions to Middle Eastern sweets. removed with the solids. This is also great for people with sesame allergies. Salloum, Habeeb; Salloum, Muna and Salloum Elias, Leila (2013). Sweet Delights from a Thousand and One Nights. To make a tarte of Strawberries. Wash your strawberries, and put them into your Tarte, and season them with suger, cynamon and Ginger, and put in a little red wine into them. To make a Tart of Strawberries. Wash your strawberries, and put them into your tart, and season them with sugar, cinnamon and ginger, and put in a little red wine into them. Mach das bedellin vnnd laß erstarcken jn der tortenpfanen/darnach nim die erber vnnd legs daraúf vmber aúfs allernechst zúsamen, darnach zúckeres woll aúfs allerbast, laß darnach ain klain weil bachen, geúß ain malúasier daraúf vmber vnnd laß ain weil bachen, so jst er gemacht.Das Kuchbuch der Sabrina Welserin, c1553. Make a pastry shell and let it become firm in the tart pan. Afterwards take strawberries and lay them around on top as close together as possible, after that sweeten them especially well. Next let it bake a short while, pour Malavosia over it and let it bake a while, then it is ready. The text of the original German recipe can be found here. The translation of the German recipe is by Valoise Armstrong, and can be found here. I tried cooking the Dawson recipe several times. The first time, I pureed the strawberries, sugar, wine and spices (despite there being no instructions to do so). And I used far too much wine, so the puree was extremely wet. This caused the pastry shell to completely collapse because it was far too wet. The next two times I used less wine each time, but the tart still collapsed when the pastry got soggy. And then I found Sabrina Welserin’s recipe. I found it interesting that she specified to bake the strawberries and sugar for a time, then add the wine and continue baking. And trying this, it worked. 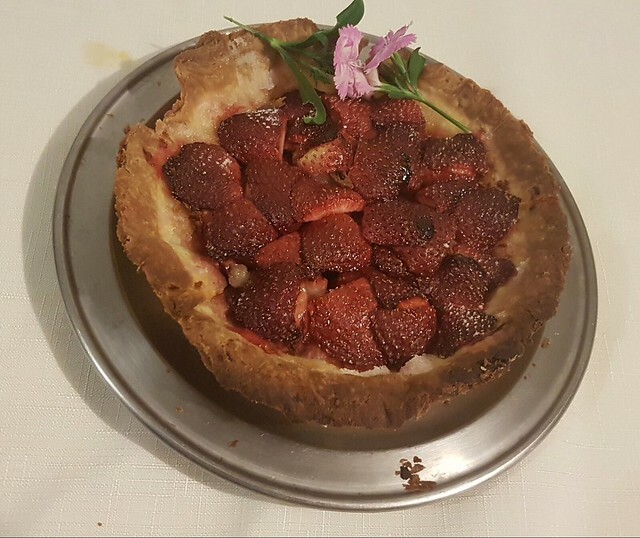 Even though the pastry still absorbed some liquid from the strawberries and sugar, adding the wine after they had baked a while ensured the strawberries absorbed the wine, not the pastry. I would recommend eating the strawberries from the pastry shell with a spoon, then eating the pastry separately. It’s still very tasty. Prick the bottom of the tart shell. Line the tart shell with baking paper and fill with weights. Blind bake the tart shell for approx. 12 minutes in a 200°C oven. Remove the paper and weights when finished. Return the tart shell to the oven and bake for a further 8 minutes, to firm the base. If necessary, line the rim of the pie with foil to stop it browning too much. Wash the strawberries and remove the stalks. Cut any large strawberries into smaller pieces. Arrange the strawberries in the pastry shell, and sprinkle with sugar and spices, if using. Bake the tart in a 160°C oven for around 10 minutes, until the strawberries have softened. Drizzle the wine over the strawberries, and return to the oven for a further 5 minutes. Leave the tart to cool, and serve cold. You will probably want to spoon the strawberries out of the tart, and eat the pastry separately. Modern strawberries are typically hybrids of the indigenous European variety, Fragaria vesca. These would have been used in the medieval and early modern period. They are extremely sweet, but tiny. If you want to use them, you will probably have to grow them yourself. You will need more than one plant to provide the fruit to make a single tart. The plants and seeds are frequently sold was “wild strawberries” or “alpine strawberries.” You may also be able to forage them in Britain and Europe. Malavosia is a sweet, fortified wine, originally from the Greek island of the same name. A similar wine is produced on the island of Madeira, which is why I have substituted it. The tart is garnished with dianthus flowers, also known in Elizabethan England as gillyflowers. They are edible (rather tasteless, but they are pretty!). 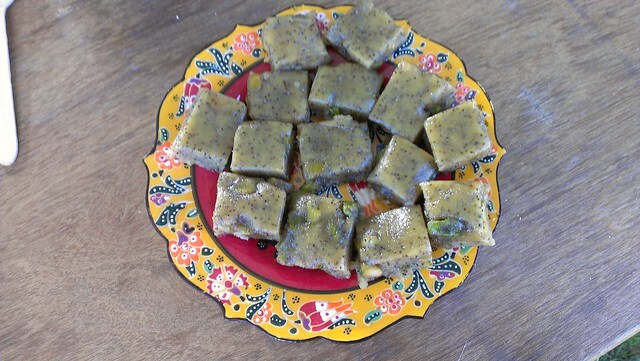 Hulwa a’Jamiyya: Take half a pound [ratl] of flour and fry it in four ounces of sesame oil. Take a pound [ratl] of honey and put it on the fire, and if the honey is strong, add water. When it boils, throw it hot on the toasted [flour] and stir it and beat it white. [Take] poppy seeds and pistachios for it and throw them on it. Let the honey be covered with a dirham of saffron. Stir it and put it up covered. Kitab Wasf al-Atima al-Mutada Chapter X (The Description of Familiar Foods, trans. Charles Perry). Features in Medieval Arab Cookery, ed. Maxime Rodinson. When people think of halwa (also halva, halvas or hulva) today, they think of the yummy, slightly gritty sesame-based sweet with nuts. But this is only one type of halwa – halwa literally translates as “sweet,” and refers to a dense sweet based either on flour and honey or sugar syrup, or nut butters/pastes and syrup. One of the great problems I’ve found with redacting historical recipes is the translation of measurements. For instance, a common measurement in these recipes is the ratl, which often gets translated to “pound.” However, a ratl is NOT the same as an imperial pound, which caused bad results until I found metric equivalents. Furthermore, the same term had different meanings at different times and places, and ratl is certainly indicative of this! If you are interested in checking weights and measures, this site is a great place to start. For reference’s sake, in this recipe I have used the C12 Egyptian measurements. This is why I stick to metric measurements when I write recipes. It’s less painful. Put the pistachios in a bowl of boiling water for about 20 minutes, then rub off the skins. Allow to dry. In a big, heavy based pan, heat the sesame oil over a low heat and then add the flour. Stir well so the flour is completely coated with the oil. Keep stirring for around 10 minutes, until the flour has gone golden and smells toasted. Be careful the flour doesn’t catch and burn. In another saucepan, heat the honey to the soft ball stage (112° – 116° C). Then remove it from the heat and skim off any scum. Steep the saffron threads in boiling water, then stir into the honey. Pour the honey into the toasted semolina, and fold in gently until well mixed and the mixture is pale. Add the poppy seeds and pistachios. Pour the mix into an oiled cake tin, and cover with cling film. Leave in the fridge for at least a day to allow the mix to set properly. When set, slice the mix with a knife dipped in warm water. When you are dealing with sugar syrup in candy making, you’re transforming sugar from a solid to a liquid, and then back into a solid again, but in a more cohesive form. You combine the sugar with water to dissolve it; but when sugar heats up, it keeps right on getting hotter (unlike water which reaches 100°C and doesn’t get hotter). As the sugar transforms from solid to liquid, you are evaporating water out of the sugar syrup, and the amount of water evaporated will affect the final texture. More liquid evaporated will result in a harder candy. Prior to the invention of candy thermometers, candy making relied on spooning some of the syrup into cold water and watching how it behaved. It’s known as the “cold water method” of checking the temperature, but the candy thermometer is much more precise. You can also treat honey as sugar syrup, but the results will have the distinctive honey flavour, and it needs to be watched more closely to ensure it doesn’t burn. However, honey is less likely to crystallise badly when working with it. (LeBau, 2012, 21). When working with sugar syrup, as I said, it can get a lot hotter than boiling water. And it’s sticky. SYRUP BURNS HURT. So be very careful when working with sugar syrup that you don’t splash yourself with it. The same goes for hot honey. Because making candy from sugar syrup relies on evaporating the water from the sugar, it’s best to make candy on a cool, low-humidity day. Trying to make candy on a day of near 100% humidity, unless you are in an air-conditioned kitchen, is pretty darned impossible. You don’t want to heat sugar syrup too rapidly; otherwise it can burn easily, or start to re-crystallise too quickly, and become grainy. Dissolve your sugar over a low heat, and once the sugar has completely dissolved, stop stirring. While the sugar syrup is cooking, regularly brush the sides of the pan with a soft, natural bristled brush. This will brush any syrup that has splashed onto the side of the pan back into the pan, and this will also stop crystallisation. If you are used to Asian cooking you’ll assume sesame oil should only be used sparingly, as the type of sesame oil used in Asian cooking can be overpowering if used heavily. However, this type of sesame oil is produced from toasted sesame seeds, which heavily concentrates the sesame flavour and aroma. If you are familiar with modern Indian or Middle Eastern cooking, you might have come across virgin or cold-pressed sesame oil, which is much paler and more subtly flavoured. This is the sort you need to use for baking. If are going to be cooking for anyone with a sesame allergy, almond oil, rice bran oil or canola oil make good substitutes (the last two don’t have any flavour).